ST. LOUIS - Webster University’s Natural Area – a stormwater retention pond located behind the garage – is changing the way water experts view retention ponds. 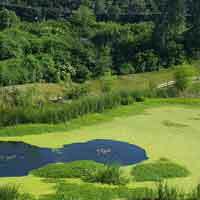 A group of storm water and landscaping experts will visit the Natural Area Wednesday, June 22 to ask questions about how it was designed and how it functions. They are just the latest in a series of visits from experts around the world who have visited the pond in the past few years. The Natural Area was created about eight years ago out of necessity. The construction of the East Academic Building meant that there would be more rain runoff in the area since the building would be taking up a large footprint of ground. With nowhere to go, heavy rain could cause sewer systems to overflow or could cause localized flooding. The Natural Area would serve as a place where water could be temporarily stored until it naturally filtered back into the ground, while simultaneously filtering out dirt, garbage or other sediment that may have been caught up in the runoff. But something interesting happened with Webster’s pond. The Natural Area kept filling up with water, even during dry periods when no rain fell for weeks on end. It’s because the area behind the garage used to be a marsh and has underground water sources, DePew said. DePew and his students started planting native plants and managing the area. Those plants improved the health of the pond and helped with the filtration process. Soon, insects, birds and wildlife were attracted to it. So far, DePew and his students have identified 18 species of dragonflies, five species of frogs, countless birds (including ducks and geese), and at least one endangered Missouri minks in the pond area. Earlier this year, Webster University had a retention pond expert survey the Natural Area to confirm that it was still meeting all required standards. The inspector’s report says the pond is doing an exceptional job at controlling sediment accumulation and water quality at a level much higher than traditional retention ponds. “I am impressed with the design and function of the Webster University Storm water Pond,” the inspector wrote in his report. The pond has attracted a lot of professional attention over the years, DePew said. He has presented papers about the pond at numerous national conferences over the years, and this will be the third time the storm water and landscaping experts will visit the pond during their annual Shaw Series lectures at the Missouri Botanical Garden. This group of experts is in town for the Shaw Series “2016 Salons & Greener Storm water Solutions Training” conference. As for the future of the pond, DePew said he has received grants to maintain and study it further and hopes to make further improvements, such as the additional of an observation deck and some more picnic tables. And he’s looking forward the creation of a second retention pond as part of the parking garage expansion. Working with the University and his students, he hopes to replicate his success in that pond and expand the Natural Area on campus. Wednesday’s tour of the Natural Area is schedule from 4:20 p.m. to 5:20 p.m. Wednesday, June 22. For more information on the Shaw Series, visit http://www.missouribotanicalgarden.org/visit/family-of-attractions/shaw-nature-reserve/gardens-gardening-at-shaw-nature-reserve/native-landscaping-for-professionals/the-shaw-series.aspx.